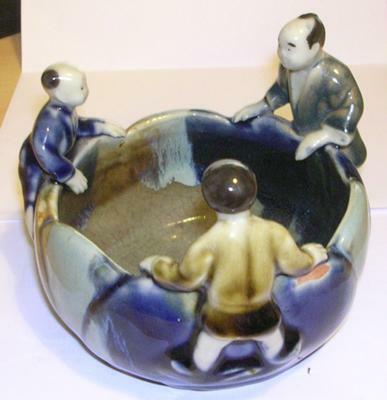 Please can anybody identify a four and a half inch diameter bowl with three Chinese or Japanese figures around it. It was bought at a sale by my mother who liked it a lot but had no idea whether it was old or modern. I am interested to know what the figure are doing. Transfer you photo if you can to a computer then save as an npt file -- I think. I am interested to know if the bowl is modern or antique. My mother bought it at a sale but did not know its origin. I have a similar item a bowl with an old chinese man, similar colours. My bowl is signed. How can I send photos? Upload images with a new submission, mentioning this post. Or better, upload pictures to a free image site like Photobucket, then post the link here using another comment. It is difficult to tell whether it is Japanese or Chinese. The man seems to have traditional Japanese hair, while the child's looks more Chinese. What they are doing I do not know, but this could be a type of brush washer.